For very early stages of any inflammatory process, either colds or flus, Ferrum phos may be useful, when the symptoms are vague, there’s a feeling of not being 100% or ther may be a short, dry cough, with no expectoration. When the cough is dry, barking, comes on, or is worse, in the evening, especially after being out in the cold winds that day, Aconite. When the dry, barking, repetitive, cough is accompanied by a fever and a flushed face, Belladonna. A painful, dry cough, where any movement makes it worse, or it’s so sore to cough the chest or sternum has to be held, Bryonia. A dry, tiring cough, usually accompanied by blocked nose overnight and runny nose during the day, Nux vomica. When the dry cough is raspy and barking, like a seal, especially when it develops into this around midnight, consider Spongia. A dry, yet barking cough, again holding the chest with their hands, coughing to retching or vomiting, often worse at night, Drosera. The dry, teasing, continuous cough, from a tickle in the throat, especially worse for breathing in cool, or cold, air, or going from a warm to cold room, preventing sleep, Rumex. 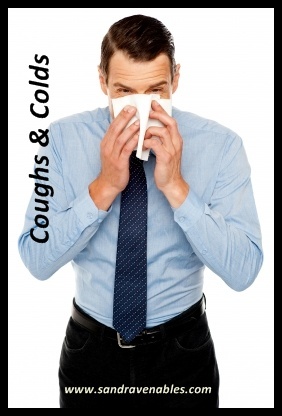 Often the initial dry cough is considered to be the first stage of a cold. One of the joys of homeopathy is learning about ‘new’ remedies. These remedies may either be new to the materia medica, that is, recently introduced worldwide, or they may be a remedy that is new to me. The latter is the case for Gallcium acidum. It is a remedy that has been utilised in homeopathy for a long time, though it’s application has not been that obvious to me. 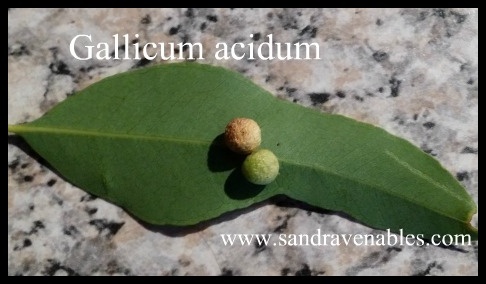 I was intrigued to be on a webinar describing Gallicum acidum, then the next day, when out walking, I found these two beautifully formed Gall nuts. These are one such source of Gallicum acidum. It is also found in tea, red wine and sumac. In the days of past, it was used to stop haemorrhaging. The main mental symptom for Gall-ac that was originally published has lead to an interpretation, where it is useful for children that I may see in clinic today. A summary of this presentation can be the child who is constantly demanding your attention, always wanting to be watched when they are doing something, to be praised for the thing they have done. When your attention is diverted from them, there is a jealousy of this, resulting in some different behaviours, tantrums (loss of control, destruction, cursing, swearing, rude behaviour) and manipulation of the situation to return the attention to themselves. There may be a constant “Mummy, Mummy (or Daddy), look at me, look at what I’m doing”, “I want to sit by Mummy/Daddy”, “Mummy, do you like what I’ve done?”. This desire for attention, to be watched and observed by their loved one appears to derive from an underlying fear of abandoment, a fear of being left alone. Often this situation can occur when it’s time for the primary care giver to return to work, and the child is placed in daycare, or they begin schooling. The separation feels like this abandonment they have been fearing will happen. It may also occur after a family breakup, when the child is unsure which parent they’re to go with. Often strangers will comment that they are such a sweet child, as they wish to be seen to be doing the best, so until the relationship is stronger, the tantrums will not show themselves. Instead, the anger may be held in, resulting in a very tense body or a clenching of the jaw. When tantrums occur, they are very intense, as well as sudden. The intensity can be destructive, malicious, cursing, rude and inconsiderate of how it’s affecting those around them. Picture the situation in a shopping centre, when the parent is very embarrassed by the tantrum of the child where there is biting, cursing, kicking and screaming. Once the attention is returned to them, the tantrum ceases. There can be a restlessness in their sleep also, a tossing and/or moaning, or a rolling of the head, along with excess saliva or perspiration. Compulsive touching, smelling or collecting (stealing) of things can be seen also. Although they will do a ‘wrong’ thing, e.g., stealing, or bad behaviour, they will deny that it was them, as they want you to see them in a good light, so will lie or hide what they have done wrong. This remedy compares closely to Stramonium, Belladonna, Hyoscymus and Tuberculinum. Differentiating between them is the art of Homeopathy.